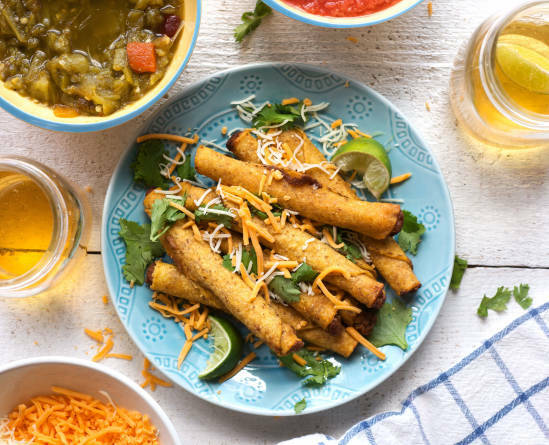 You might call these homey rolled-style tacos “taquitos,” or, if you grew up around Clovis and Portales, “taquitas.” I call them addictive. The canned vegetable has the right texture for smushing into the beef as a binder. If you turn your nose up at the idea, you can use the beef-potato mixture described in the previous recipe. The filling can be made a day ahead. Reheat before proceeding. Heat a large skillet to medium high. Add the beef and cook until it is uniformly browned. Break up the meat as it cooks, adding the onion when the meat has lost its raw color. When the onion turns translucent and begins to brown, add the garlic salt, optional cumin, and the corn or peas with the can’s liquid. Bring the mixture to a boil, then lower the heat to a simmer and cook for about 10 minutes. With a potato masher or large fork, mash the canned vegetables into the meat. Let the meat-and-vegetable mixture brown in the pan. It will begin to stick as it browns. Turn the mixture, scraping up the browned bits, and break up into small pieces. When the filling has lots of browned flavor, add more garlic salt if you wish. Keep the filling warm. Pour about 1 inches of oil into a deep skillet or heavy saucepan. Heat the oil on the stovetop until it ripples. With a pair of tongs, briefly dip each tortilla into the hot oil. In a matter of a few seconds, the tortilla will become limp. Remove it immediately and drain it. Repeat with the remaining tortillas. Spoon 1–2 tablespoons of filling on a tortilla and roll up snugly but not tightly. Transfer each taco to a rimmed baking sheet. Repeat with the remaining filling and tortillas. Bake the tacos for about 20 minutes, or until crispy-chewy, to your taste. Sprinkle with cheese and return to the oven for several minutes, just long enough to melt the cheese. Serve right away.